I feel very lucky to live in Vermont now where Farm-to-Table is a way of life, and culinary, farming, and outdoors experiences are available at every turn. Case in point: I just took an awesome class on Bread Baking using wild yeast to make natural sour dough breads. (This means you don't add any yeast, you use a sour dough starter and you let the dough sit around through several stages of fermentation and dough "folding" before you bake.) The class was held in the kitchen at Brot Bakehouse School and Kitchen at Brotbakery in Fairfax, Vermont. It was a beautiful, warm space with brick and wood floors, wood counter tops, exposed beam high ceilings and a built-in wood fired oven. It was cozy inside while the outside was surrounded by snow, and Heike Meyer the instructor was warm and welcoming as well as engaging and inspiring. We ended the class with a "bread tasting" where we learned what to look for with the crust, the crumb, the smell and taste. And the bread WAS AMAZING. Seriously, amazing: crusty on the outside, moist and chewy on the inside with a slight tang of sour dough, made with a mix of freshly ground whole grains and some corn/polenta even. It was baked that morning in the wood fired oven and was still a little warm inside. We added some cultured butter after the first taste....HEAVEN. I had to buy some to take home for my family to all sample (100% thumbs up - we ate it all that day). Plus we each left with some of Heike's sour dough starter, instructions for how to take care of it and a portion of dough we worked with to bake at home that night. I hope to go back for many more classes! The School of the New American Farmstead at Sterling College is a continuing education program that has lots of 5-day classes such as "Small-Scale Dairying", "Ecological Orcharding", "The Art of Natural Cheesemaking", "Small Batch Brewing", "Market Gardening Master Class: Biointensive Crop Production", "Farmstead Toolmaking", "Social Permaculture", "The Art of Fermentation". They are mostly offered in sequential weeks during May - Sept - so plan your vacation now. Sterling college is in Craftsbury, VT. (Accommodations listed here). Shelburne Farms offers classes throughout the year. A few upcoming 2017 classes include: "The Art of Natural Cheesemaking with David Asher" a two-day class June 20-21 (Tue& Wed) by the author of The Art of Natural Cheesemaking, they are also hosting the 9th Annual Vermont Cheesemakers Festival on July 16, 2017 where you can sample and buy cheeses from 45+ Vermont Cheesemakers and 90+ Vermont artisan food producers. Shelburne Farms has an inn and guest houses onsite, and there are lots of places to stay nearby too. The Morrill Homestead in Strafford, VT offers Gardening and Homesteading workshops as well including "Pruning and Grafting Fruit Trees", and "Traditional Farmstead Skills." Ellen Ecker Ogden, author of The Complete Kitchen Garden lives in VT and gives lectures and presentations all over New England. In August she'll be presenting "The Art of Growing Food" at Morrill Homestead. Brot Bakehouse School and Kitchen at Brotbakery - has a Culinary Vacation collaboration with Hotel Vermont (Burlington) and The European Artist B&B (Underhill). Rates at Hotel Vermont include a Sunday class for 2 at Brotbakery - but I think you still have to plan your trip around when Brotbakery has a class scheduled. Call them to find out! This is a nice weekend getaway idea. Can you recommend any Vermont Homesteading, Gardening, or Culinary courses that you can plan a vacation around? Let me know in the comments! The Farm.House has moved to Vermont! At our new home we have the pleasure of starting with a "blank slate" for landscaping, and a full acre of land. I've been working on the new design for my bigger and better garden and well, if you know anything about me and my passion for growing organic vegetables and fruit beautifully, you will not be surprised at the result.... When complete, the garden will be 50 feet x 50 feet. Because it is such a large effort, we'll be building it in phases over 3 years, with a perimeter fence going around it in the final year. Inspired by the gardens at the Chateau de Villandry, the Garden will be 50' x 50' when complete. Photo from the official site of the Chateau de Villandry. 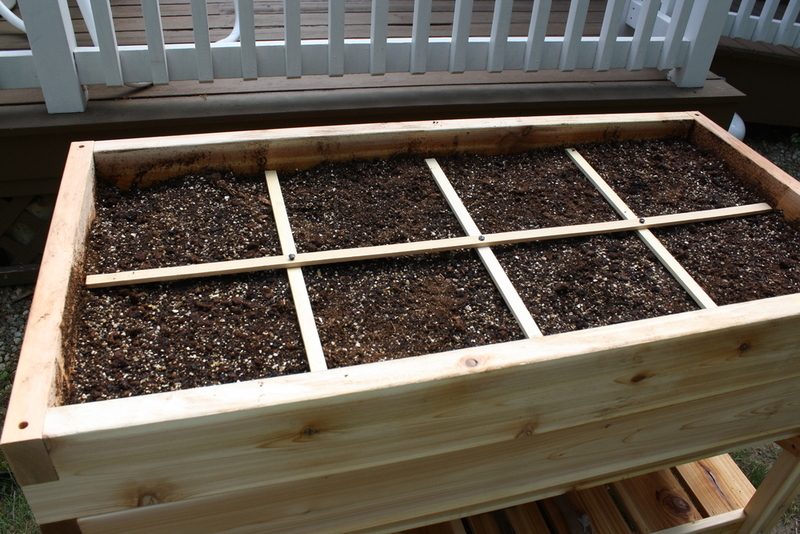 The garden will of course consist of raised beds, using the Square Foot Gardening method, vertical trellising and intensive spacing. The garden incorporates the recommended 3 foot wide pathways, and any beds which will be accessed from one side are no more than 2 feet deep. I plan to use gravel again for the pathways and to put a perimeter deer/critter fence around the outside. On that fence I will be adding espaliered fruit trees and/or grape vines. The garden will contain some "permanent" perennial plantings such as raspberries and asparagus, but mostly will be used for annual vegetable gardening. The Four Quadrant design will make any crop rotation easy as I can simply move the plantings each year counter clockwise from Root>Fruit>Leaf>Legume. I've saved spaces in the corners for a potential rain barrel watering system experiment. Corners are really difficult to work in when there is a fence around the outside, so keeping the corners free avoids having to reach awkwardly to work the gardens there. The center of the garden is a clearing of about 12 feet x 12 feet. I'm considering using that space for a table and chairs - perhaps to teach garden classes there! Or use the space for a greenhouse, or retention pond / cistern. Year two - We will double the garden size by building the other half of the interior garden beds. Year three completes the garden beds and includes a fence. To give you a sense of context, this is roughly the site plan of our lot showing where the big vegetable garden will be. In front of the house will be more raised beds (from our old house, the front yard garden) which I am planning to devote entirely to Strawberries, bordered by Alyssum. And of course I'm planning edible landscaping in the form of Blueberry bushes, espaliered Pear and Peach trees along the front and back of the garage, and more! Here's a panoramic shot of the property currently - waiting for Spring. Let me know what you think! What do you do when to only available space in your yard is in the shade for most of the day? Don't give up! there are plenty of vegetables you can grow even if your space receives less than 6 hours of sunlight per day. The bloggers at Small Footprint Family have compiled a list of 28 vegetables that do well in "partial shade" or "partial sun" (- and they explain the difference between the two). Check it out here. Which veggies have you had success with in shady gardens? If you are planning to start your tomato and pepper plants from seed, now is the time to start thinking about which varieties you want to grow, and to place your orders from your favorite seed suppliers. Pepper seeds need to be started indoors 10 weeks before the last frost date. Tomatoes should be started 6-8 weeks before the last frost. If you live near me then peppers should be started around March 1st and tomatoes should be started between March 15 and 29th. What are last frost dates? Chile peppers can grow abundantly on one plant so you won't need many seedlings of each type usually (by 'abundantly', I mean they just keep coming! maybe 40+ peppers per plant?). A bell pepper will produce about 5-8 fruits per plant. My husband loves super hot chile peppers so I always grow at least 9 types including habaneros, arbol, jalapenos, serranos, plus several types and colors of bell peppers and pepperocinis. More about tomatoes and peppers later-- For now get ordering those seeds! I love to see other people's gardens, and I especially love to see the gardens that are built by students of my Square Foot Gardening classes! It brings me so much joy to motivate others to start vegetable gardening and expand their skills. Grace recently took a class from me and started her first Square Foot Garden with her son this past memorial day. Grace's Square Foot Garden: "maintenance has been so minimal... we just water. not one weed yet. we love it!!" With her son she mixed the soil, filled the box, added a grid, and started planting! They sowed some seeds and transplanted some seedlings: Peppers, corn, beets, fennel, beans and more! "Doing it with him has been such a blast and I would be thrilled if that inspired others to involve their kids"
Experiment, be creative, start small and expand as you build confidence and skill. And garden with a loved one! Tomatoes are the jewels of my garden, the prize we wait all summer for. Now is the time to order your tomato seeds for seed starting in about 2 weeks here (zone 6a, Boston area). I'm sharing the varieties of tomatoes I have grown that have been most successful (and least successful) in my garden (zone 6a, Boston area). With Square Foot Gardening we use the vining, Indeterminate type so they can grow vertically, in a single cordon up the trellis. And since I have experienced almost every type of tomato disease in my garden over the years: early blight, late blight, fusarium wilt, Anthracnose and verticillium wilt, I tend to grow hyrbrids with disease resistance built in. This year I'm going to be brave and try some heirlooms again though. Sun Sugar - bright orange tiny tomatoes, they were the hit of the neighborhood/workplace/family. So sweet you don't want to stop eating them, and very prolific plants. They were very resilient and disease free all summer. Lemon Boy - Lemon yellow medium sized tomatoes, slightly sweet with a touch of acid. Perfect sliced up on toasted sour dough bread, with a little olive oil, salt and pepper. These are one of my family's favorites, and the yellow color brightens up a a Caprese salad and surprises many who have only known the red tomatoes from the store! Mountain Magic - this resilient plant produces perfect red salad tomatoes in abundance. The tomatoes have a good flavor, and though they tend to branch more and need more vigilant pruning than some other plants they are very reliable producers and very resistant to disease. Burpee's Supersteak & Beefmaster - Both varieties did very well and grew 2-pound red tomatoes with a slighly more acid taste. Gold Nugget - I swear the website said this was indeterminate, but I must have misread it. In fact it is a determinate variety, which I learned after it failed to grow more than 2 feet tall and kept branching and branching as if it had no central stem and wanted to be a bush... and it was susceptible to some disease in my garden so it was basically a hot mess. San Marzano and German Giant - both heirloom varieties, they had no resistance to the diseases in my garden and very little of the fruit survived. Amish Paste tomato - High Mowing Seeds sells organic Amish Paste seeds which are a good variety for canning ans sauces as they don't have a lot of seeds. They are an heirloom variety so wish me luck! Brandywine - Another heirloom, from the late 1800s Brandywine is famous for its pink color and oustanding flavor. Large, juicy delicious tomatoes that I hope survive in my garden this summer. I taught the class as a fundraiser for the Assabet Village Food Cooperative which is a volunteer-run start-up food co-op in the Boston Metro West area. I served on the board for about a year and have been volunteering for a couple years trying to help get this cooperatively owned grocery store opened in Maynard, MA (a town without a grocery store). Each of these books have a place of honor on my gardening and homesteading bookshelf. Which books would you add? Designing the New Kitchen Garden - this book inspired me to design garden spaces that are as beautiful as they are functional. It details how classical potager garden design can be applied to home kitchen gardens. The Backyard Homestead: Produce all the food you need on just a quarter acre! This is an amazing reference for all the homesteading activities you can support on a typical suburban lot. It starts with a very cool set of plans for a homestead on .10 acre, .25 acre and .5 acre lots. It covers fruits, nuts, poultry, livestock, beekeeping etc. The local newspaper interviewed me about my suburban micro-farm last summer which was a lot of fun. By showing that food production can be easy, and can enhance the landscape, I hope more and more will come on board and help bring back some of these forgotten skills.